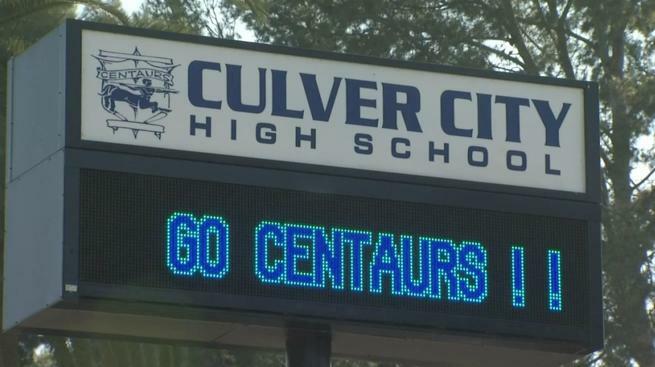 The meeting of the Culver City Unified School Board on Jan 22, 2019 started out with a room crowded with local celebrities; the CIF Champion Centaur football players were there. The evening’s agenda started off with both the coaches and the players getting certificates of commendation for their outstanding achievements as the top team of the region of the 2018 season. As each player was called up and presented with a certificate, the well of the Mike Balkman Council Chambers filled with happy young men in blue shirts, accepting applause for their victories. A presentation by the new Principal at La Ballona, Luis H. Ramirez, highlighted a shift away from the ‘Character Counts’ tradition and into a new social development format called “CHAMPS.” Ramirez answered questions from the board about how this format benefitted the students and the social structure at the school. The La Ballona PTA also previewed a new mosaic to be installed at the school in February. A motion to change the agenda brought the discussion of the option of a later start time for the high school in before the recess, and there was much to discuss. Originally considered by the board during the previous school year, when a California state bill to create a later start time for high schools had passed both the assembly and the state senate, there was momentum to create a standard before one was imposed from above. When Governor Brown did not sign the bill, it reverted to being a regional option, which put it back on the agenda for CCUSD. School Board President Dr. Kelly Kent and Board member Dr. Steve Levin had both favored the idea during the previous discussion, and did so again last night. Citing evidence from a number of sources, most notably the American Pediatric Association, Levin offered their conclusions that “most teenagers need nine hours of sleep per night, and don’t have the ability to fall asleep before 11 p.m.” The medically accounted challenges of sleep deprivation began with “poor academic performance, ” and included a statistical increase in depression, anxiety, obesity and suicidal ideation. While Dr. Kent’s neurology background had her in agreement with the evidence cited by Levin, others on the board were not so welcoming of the idea. Parliamentarian Anne Allaire noted the challenges of working families to coordinate morning schedules. Board member Summer McBride cited equity concerns, and the need for the district to consider those students accessing breakfast at school. Board member Dr. Tashon McKeithan was concerned as to how funding would be affected for after school programs. Members of the audience were equally divided as to the idea of a later start for high school. Christy Manos gave a detailed comment on the challenges of single parents with multiple children co-ordinating schedules with extracurricular activities. Jamie Wallace spoke for Dr. David Stout, who was busy working with the Robotics team on campus and could not attend; his perspective was that a later start time would be beneficial for students, parents and teachers. With a host of concerns and possible drawbacks facing a large amount of evidence and benefits, the board voted to arraign a conversation with another California district that had already implements a later start time to discover what the community response and measurable effects had been for them. The Menlo Park School District was offered by Kent as one of similar diversity as Culver City, and a probable match to study. I sat through Tuesday night’s long public discussion on how we, as a community, should go about starting to look at a way to set the school day later for our local teenage-students. I believe it was finally decided that our district administration would call a district that has implemented the time change in its schools–such as, Menlo Park. Why should we limit our outreach to only “successful districts.” Why don’t we also call on those districts that have either looked at it and decided not to do it or tried it and returned to regular starting times. We ask them the reasons why they didn’t implement it or change back?” We should listen to both sides and not limit ourselves to just the one positive side of the issue. Could we not learn from their “missteps” and/or flawed implementation?